Quillworts (Isoetes species) are an aquatic group of lycophytes, so named because of their upright, tubular leaves. They usually grow at the bottom of lakes and mountain tarns. 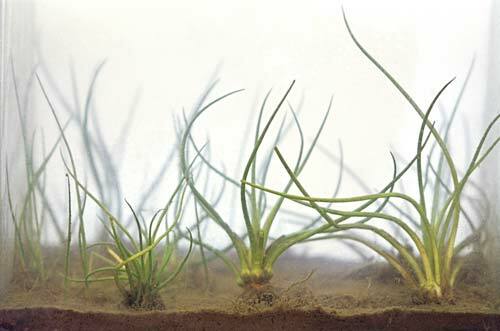 Completely submerged plants form dense tufts of leaves up to 30 centimetres high, while plants growing at the water’s edge are usually much shorter. Spores form at the base of the leaves and are released into the water when the leaf dies. Quillworts are fairly common in many South Island lakes, but are rare and declining in the few North Island lakes they inhabit.